Plenty of attention on this trio at GIIAS 2015, despite the fact that they’re not new launches or concept cars, but production models from Daihatsu’s JDM range of kei cars brought in to add variety to the stand. We start with the cool Daihatsu Move Custom RS. If the name is familiar, it’s because there was a time when many Perodua Kenari enthusiasts wanted to transform their Move L900-based box to a Custom RS. The current Move was launched late last year in Japan and the Custom is a sportier version with a unique face that links the headlamps (LED projectors and DRLs) to the lower bumper. There’s also a black roof, big rims and an all-black cabin. The Move is moved by a turbocharged 660 cc three-cylinder engine with 64 PS. Also launched late last year is the Wake, which Daihatsu Kyushu also produces for Toyota as the Pixis Mega. It’s the tall boy of tall boys with a class-leading cabin height of 1,455 mm. Excellent driver visibility is also a selling point and it’s easy to see why. With twin sliding doors and the ability to fold three seats flat, the Wake is a versatile car, as demonstrated here with a mountain bike. This unit comes with BBS wheels, a Momo steering and the same 660 cc turbo triple as the Move. Less oddball than the Honda N-Box Slash. Last but not least is the cute Mira Cocoa, the bug eyed successor of the Mira Gino (yes, the inspiration of those retro modded Kelisas). One for the girls, our Cocoa sports a dual-tone pink and white colour scheme, which extends to the wheels and cabin. The end result looks almost too fragile to drive! Wouldn’t our streets be more lively with cartoonish characters like these buzzing around? Wow. I am attracted to Daihatsu MOVE. Mini alphard the white 1. Maybe next year Perodua will launch it as All-New Kenari. this time round no malaysian converted price? Kamon perodua bring in the kenari replacement!! P2,pls bring in Move for kenari replacement…. wow! 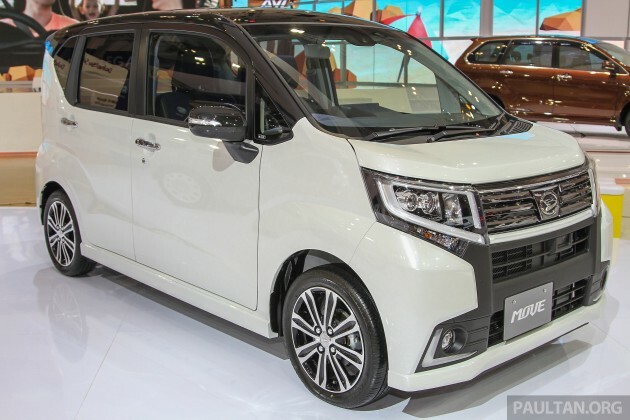 i want that daihatsu move, like a mini vellfire! Actually the D move isn’t that expensive. I’m driving a red one in Japan. With turbo engine, navigation system and its price about rm55,000. ala tomei2 baby alpad ni haha..